Jenna Baker of Jenna Baker Jewelry designs jewelry out of her studio in Apex, North Carolina. She uses precious metal clay, a material made of metal particles and a binding agent so that it can be sculpted like clay. Come sneak a peek into how this unique art is made and the beautiful results. I love metal working but I’ve never been able to jump into it. How did you get started with metal? I did an internship in college for a lady who owned a small jewelry business. She taught me all the basics – wire wrapping, using jewelry tools, and basic jewelry construction using beads, stones and chain. She was an inspiration, showing me that a person could earn a living off of their craft. A few years later, I was trying to get back into my passion for jewelry making. 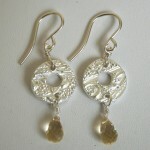 I knew I wanted to work with silver, but without a background in metalworking I didn’t know where to start. I came across a book on precious metal clay (PMC) that got me instantly hooked. 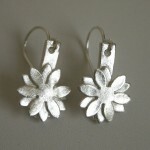 PMC is composed of fine silver particles, water and a binder which creates a nice malleable clay. After the clay is shaped and dried, it’s fired with a torch or kiln to burn away the water and binder, leaving behind just the fine silver. I researched the material and the processes involved and decided to give it a try. In January, I ordered a small amount of PMC, bought a torch and jumped in head first! After some trial and error, I had a few pieces complete and ready to sell. How has the rising cost of silver impacted your shop? Right before I opened my Etsy shop, the cost of silver increased and the cost of the PMC went up with it. I took this into consideration when pricing the jewelry in my shop. The costs have continued to fluctuate a little, but not enough to make much difference. Can you tell us about the technique you use to make your jewelry? I start with a small lump of PMC, which I roll into a smooth ball and then roll flat. I stamp or texture the clay and cut it into the desired shape, adding holes for any findings that will be needed for the finished product. The clay is allowed to dry completely, then I sand the piece and drill out any holes to make them nice and neat. Then the piece is ready to be fired. I use a butane torch to fire my pieces; as the water and binder in the PMC burn away, the silver particles remain. 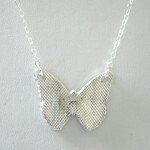 The pure fine silver is strong and ready to be polished for jewelry. 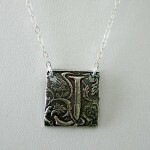 The silver is white after firing and must be burnished with a wire brush and polished to reveal the shiny silver color. The silver is ready to be made into a necklace or earrings at this point, unless I want to add some contrast with a patina. I use a liver of sulfur gel added to water to patine my pieces. Do you have a favorite technique? What about a favorite item? I love the process of adding a patina to a piece. The water temperature and the pH balance produce surprising variations in color – some pieces have subtle blue, green or purple hues to them. I can play with the darkness of the patina by leaving the gel on a piece longer. I like that no patined piece will ever be exactly like the others. My favorite item so far is the Garden Necklace. I enjoy the contrast in the textures and the sense of depth created with layering and color. What has your experience been like on Etsy so far? Opening my shop was very exciting, but also a little intimidating! My biggest obstacle was probably trying to decide how I wanted to run my shop – setting up my shop policies and figuring out the business aspect of things. Now I’m learning about the importance of improving my photography, adding new items and renewing items for increased visiblity, and being active in the Etsy community. I’m proud that I have a cohesive shop, it’s so neat to know that it is out there for the world to see. I’ve slowly begun to gain admirers on some of my pieces and gotten “likes” from strangers. That’s a good feeling! Do you sell at venues other than Etsy? As a new business, I’ve sold by word of mouth – and by word of my mother’s mouth! She has been my best salesperson to date and has sold many pieces to her friends and coworkers at the elementary school where she works. What are your goals for your business in the next year? To increase sales in my Etsy shop! 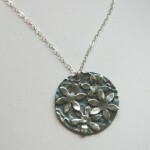 I’d also like to participate in a craft show or do home parties and sell some of my pieces in local retail stores. I definitely plan to continue to grow in my craft. I’m still very new to the world of metal clay, there are many techniques I want to learn. I’m also interested in learning enameling and want to use that and resin to add more color to my work. 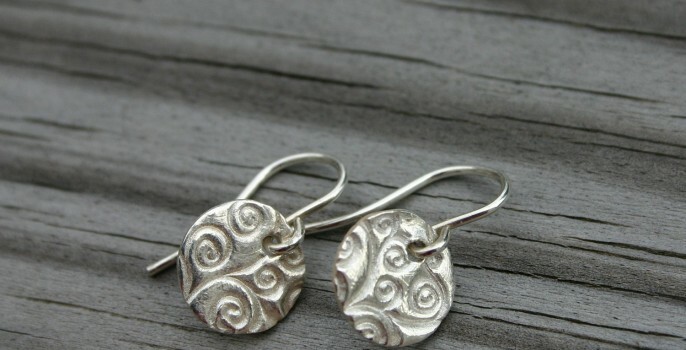 A metalsmithing class may be in my future! 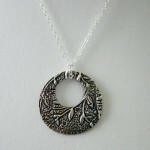 Check out Jenna’s Etsy shop to see more of her beautiful PMC jewelry. She also has a Facebook page ready to receive more adoring fans! I am excited for you and your success. Your pieces are really neat looking. We all are very proud of you. I enjoy looking at your site to see what new creation you have made. I’m so impressesed! I see people here in town wearing your pieces. I always ask is that a Jenna Baker? I know a designer, wow. Your work is lovely. Your mom is sooo proud. I am so proud of you and cannot wait to see your jewelry.